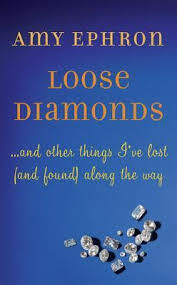 I received a free copy of Loose Diamonds from the Goodreads First Reads program. I’d read several complex and serious books in the week before I received it, so I was greatly looking forward to a nice, light read. It certainly was light but I wouldn’t describe it as nice. Ms. Ephron isn’t a bad writer and I feel pretty confident that if she found some interesting material she could do something with it, but these essays were all about really mundane topics. Most of them centered around some seriously first world problems that I couldn’t really relate to, like buyer’s remorse over a pair of boots or the theft of her mounds of jewelry. I also found her word choices to be confusing and a bit jarring at times. I couldn’t tell you how many times she started sentences with some variation of, “I remember the time…” The fact that she’s writing a book of essays about things that have happened to her should pretty well imply that she does indeed ‘remember the time’. When I see a published book of essays, I expect them to be finely tuned and impactful in some way, whether they be funny, moving or thoughtful. These felt more like reading the watered down blog of a soccer mom. Perhaps they would be interesting if you knew her but to this causal reader they were quite dull. This entry was posted in book reviews, fiction and tagged book review, ephron, fiction. Bookmark the permalink.